The data was added on ,	12 May 2017 read 506 times. Syrian President Bashar al-Assad stressed that the Russian-initiated de-escalation zones deal is a real chance for reconciliation in the war-hit country. 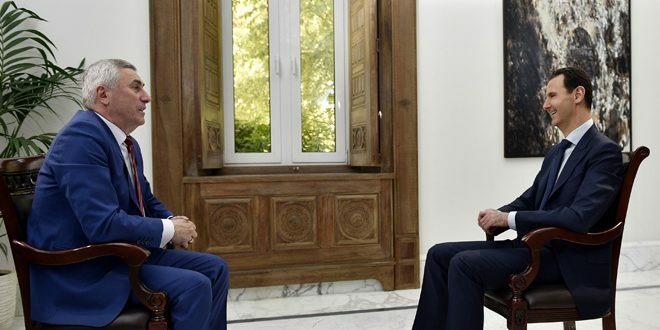 In an interview with BELARUS’ ONT channel on Thursday, Assad said that all previous initiatives have failed due to some states hindering peace by pursuing own political goals. “This is a chance for a person with weapons in hand to pause to think. In other words, if they lay down arms, amnesty would follow,” the Syrian president said in an interview with Belarusian ONT television aired on Thursday. The interview has also been published by the Syrian SANA agency. The Syrian leader meanwhile, praised Russia’s peacemaking efforts, in particular, the Astana peace talks, where Moscow proposed the creation of such de-escalation zones in agreement with the other guarantor-states – Iran and Turkey. In Astana, the dialogue was with the armed terrorists under Russian sponsorship and based on a Russian initiative…This started to produce results through more than one attempt to achieve ceasefire, the most recent of which is what’s called the de-escalation areas,” Assad noted. “It is correct in principle, and we supported it from the beginning because the idea is correct. As to whether it will produce results or not, that depends on the implementation,” the president said. The safe zones are established in several Syrian provinces, including in Idlib, Aleppo and Homs. Syrian Army killed Turkish terrorist, Muhammed Emin Kayık, with 7 Chechen near Watan Hospital in Jisr Shougur.